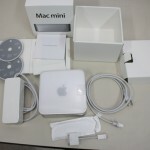 … after so long a time spent waiting – make that lusting – for an update to the mac mini, apple finally did it. it may not seem like the earthquake everybody was hoping for and surely one could spend aeons debating about the pricing, but /me thinks it’s time now. time for a mini in the living room, media center deluxe.